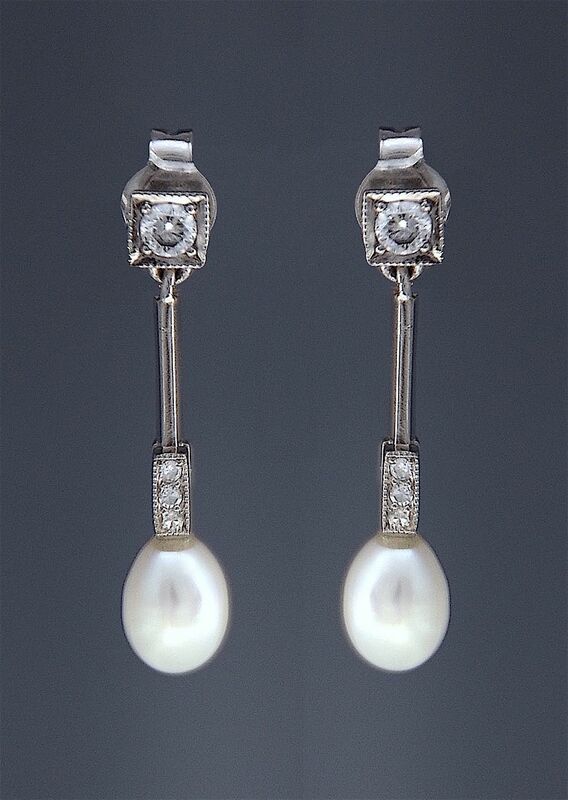 I love the classic combination of pearls & diamonds in these platinum drop earrings. The top of each earring has a round diamond set in claws within a mille-grained box setting. Suspended from each top is a knife edged bar that ends in a rectangular mille-grained box setting in which there are 3 small round diamonds fixed to the bottom of which is a teardrop shaped freshwater cream white pearl. They have posts for pierced ears and 18ct white gold butterflies. The earrings are hallmarked by the London Assay Office for Platinum & 2017 and bear the sponsor's mark "A&SP" fro Alan & Sue Poultney having been made to Alan's design. A super every day wear.